Service operates between DART Central Station and The Outlets of Des Moines, including destinations at Goodwill, East Library, Altoona Walmart (Park & Ride) and The Outlets of Des Moines. Connections: Local Route 1 at Hubbell Avenue and East 42nd Street. Local Routes 3, 15 and 60 at University and 6th Avenues. Local Route 4 at University and East 14th Street. 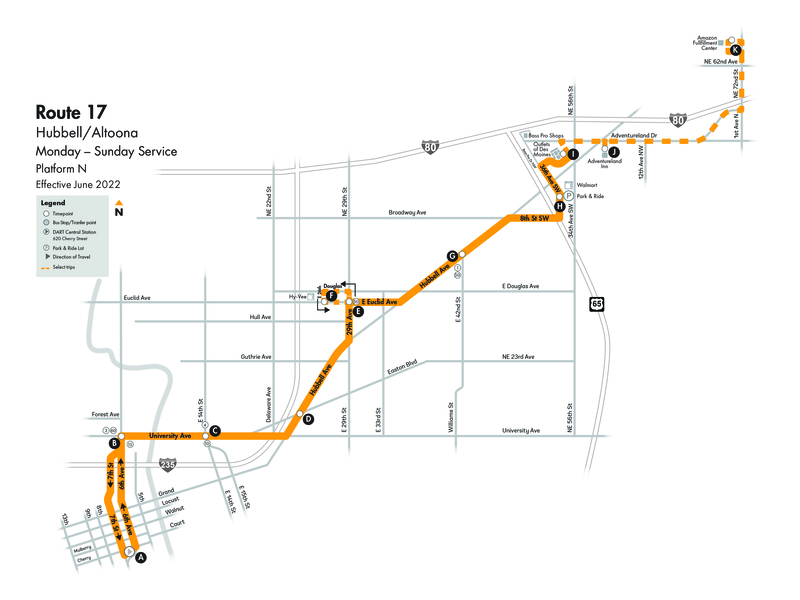 All Express Routes and D-Line Shuttle on Grand Avenue and Locust Street in downtown Des Moines. All Local and Crosstown Routes at DART Central Station. Select trips will bypass Douglas Avenue loop by taking E 29th Street to Euclid Avenue, then RIGHT (east) on Euclid Avenue to Hubbell Avenue. ​Select trips will bypass Douglas Avenue loop by taking Euclid Avenue to E 29th Street, then LEFT (south) on E 29th Street to Hubbell Avenue.